Like a lot of avid readers, one of my favorite literary genres is books about books. 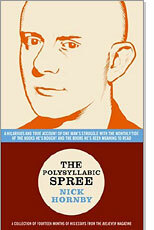 I just recently finished Nick Hornby’s The Polyphonic Spree, a collection of his essays for The Believer on his monthly reading habits. I’m a big fan of Hornby’s, but I enjoy his personal essay format most of all. (31 Songs was another one I got through in one night). Most interesting to me was the discrepancies between his “books bought” lists and his “books read” lists. Even when I go into a book store determined to buy one book that I will immediately read, I usually end up with two or three and choose to read a stack from the library before I ever get around to even taking my purchases out of the bag. Unfortunately, I would have been much more interested in hearing about Hornby’s “books bought” list. Not that he isn’t contagiously enthusiastic about the books he does read…I’m just not so much. He reads a lot of biographies about poets I’ve never heard of (because I’m practically illiterate) and sports books. Which is why I’m a bigger fan of Anne Fadiman’s books about books. Ex Libris and Rereading (which she edits) are two of my favorite reads this year. Fadiman and the other featured writers not only talk about books and authors, but the myth surrounding books and their interactions with books as a whole. 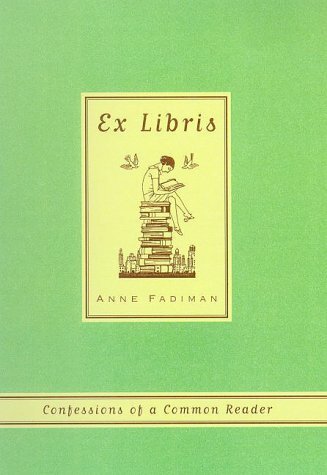 One essay in Ex Libris that I particularly loved was about Fadiman and her husband combining book shelves. While Scott and I didn’t have to suffer through this event (we have much different tastes when it comes to reading) the associations and importance she places on each material binding of pages was very relatable. Where were you when you first read The Catcher in the Rye? I don’t remember the plots of every book I read, but I always remember where I was and what I was feeling. While I wasn’t always captivated by the books they were reading or rereading, I was always interested in their associations with the books. Anne Fadiman’s father is Clifton Fadiman, the creator of the Lifetime Reading Plan. While there are problems with a literary cannon – especially this one, which stays pretty European – lists like these always appeal to me. I like checking off each entry as I read them, feeling a sense of accomplishment and some kind of validation that what I’m doing is not just leisure, but putting me on track to becoming an educated, well-rounded individual. Not this one. I have to leave an element of surprise for those that haven't seen the real thing. 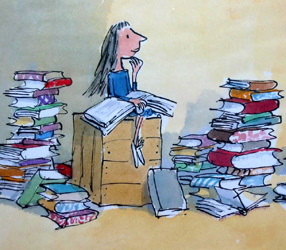 My all-time-favorite book about books is Matilda. A book I chose to immortalize (kind of…) on my ankle with the image of Matilda curled up in a giant armchair surrounded by stacks of books at the library. This is one of those books that you read chapter by chapter with three or four other books because it just makes you so excited to read. Though Charles Dickens was pretty far in my future at this point, reading Matilda made me excited to read the classics that so many kids are avoiding. I owe Roald Dahl a lot. 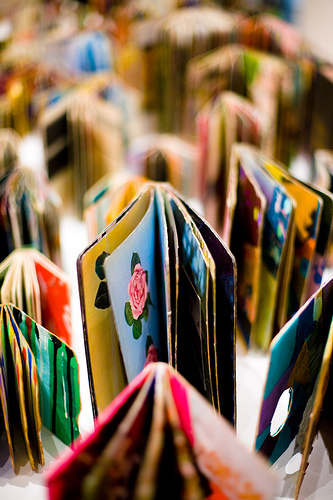 Work by Brian Belott, part of the "book/////shelf" exhibition at the MoMA.